The City of Ada declared a “State of Emergency” seven times between 1997 and 2009 due to flood events, the worst of which occurred in 1997 that resulted in catastrophic damages. The City of Ada is bounded by Judicial Ditch No. 51 (JD-51) on the north side, and the Marsh/Wild Rice River(s) to the south. Geotechnical analyses found that the channel side slopes for JD-51 adjacent to the city should be flattened from 3H:1V to 6H:1V. 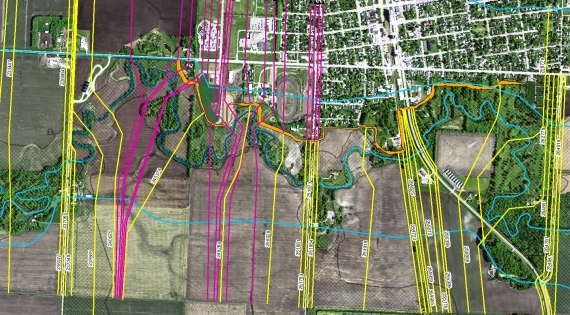 The existing channel alignment did not provide enough space for the flatter slopes as well as a levee certified for the 1-percent chance event. Moore Engineering developed a comprehensive flood control project to protect the city from the threat of overland flooding. The State of Minnesota is funding this project through the Hazard Mitigation Grant Program and upon construction of the overall improvements will provide FEMA certifiable flood protection for the 100-year flood event. A portion of the JD-51 channel was realigned adjacent to the city and levees were designed to reduce the risk of flooding from JD-51 and the Marsh River. 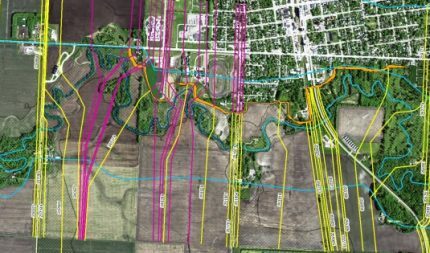 The design process included using the Hydrologic Engineering Center River Analysis System (HEC-RAS) software to model the Wild Rice River and upper reaches with unsteady flow open water and ice conditions. Those results were processed to calculate the joint probability water surface profile. The results of the modeling effort included the determination of the controlling profile that was used for levee design as well as the updated water surface elevations needed to complete a LOMR for the project. The project also required road raises, improvements to interior drainage systems, the realignment of County Road 63, and the installation of two 14-foot by 14-foot reinforced concrete box culverts where the new ditch alignment intersects State Highway 9. 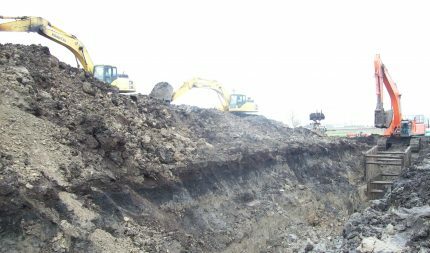 This project required coordination with MNDOT for road raises and culvert installation as well as with the MNDNR that functions as the state floodplain administrator. The project has been phased to date to allow for flexibility for grant funds to become available. The project to date has flood protection constructed for the northern portion of the city which includes the realignment of JD 51, the east side levee and the north west levee with only the south levee improvements remaining. The remaining improvements are anticipated to be under construction in 2015 if funding becomes available. Once the entire project is completed, a LOMR will be completed to effectively remove the City of Ada from the flood plain.